Last night, right before closing my eyes and drifting off to sleep for my usual three hours of shut-eye, I had a stunning inspiration for my blog. The topic ran amok in my mind, weaving its humor and epicosity through my thoughts. 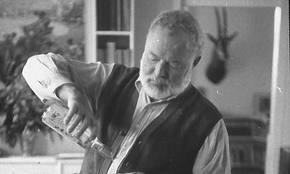 I couldn’t wait to get up in the morning and begin putting it on the page, and I have to admit I felt a little bad for Hemingway because people were going to start comparing the two of us after reading my post and they would be sure to point out that I don’t drink nearly as much as he did and plus I haven’t killed myself yet. But Hemingway is safe, for now. I completely forgot what I was going to write about and now you’re stuck with this crap. So now, instead of being titled, “The Sun Also Rises and Sets and Rises Just Like Every Other Freakin’ Day,” this post is instead titled, “Hush, Mama’s Been Drinking.” Oh c’mon, put down the phone, that was completely a joke. Although, in a perfect world, children would be able to mix drinks as soon as they had the upper body strength necessary to open the fridge. Picture it. An entire universe where children were actually good for something other than growing up to shove you in a nursing home. Well, joke’s on you, cutie pie, my retirement plan currently involves the Rapture. You want me in a home when I can’t change my own diapers, you’re going to have to pay for it. If you can’t afford to squeal the tires and grind the gears on your way out of the Autumn Cove Home for Decrepit People, I’ll be living with you. But for now, I really think the country should revisit all of the child labor laws that were enacted in the Dark Ages and by that I mean in the days before television. Yes, working conditions were lousy back then but you have to admit the conditions were lousy for everyone, not just the kids who kept getting their little stick-figure arms stuck in giant factory machinery. The only reason we tossed the little urchins out of the factories was because they kept falling asleep around three in the afternoon for naptime. If Red Bull had been around back then, those ADD little monsters would still be working on the assembly lines. There are some jobs that I really don’t have a problem with kids doing, like the aforementioned bartending. I really think it would be a good deterrent to underaged drinking. A couple of summers of watching forty-something year old women drink themselves under the table then try to hit on an eighteen-year-old busboy who forgot to zip his fly after his last bathroom break will put these little elementary school valedictorians on the straight and narrow. You want to curb the dropout rate in this country? Let the kids turn that little slow/stop sign on a road construction crew for a few 18-hour days in the summer heat. See? It works on so many levels. Let the little snots clock some time at the quarry and see if we still have the worst math and literacy rates in the industrialized world. We’ll have so many kids going to college that we’ll have to shove them off on other countries’ colleges when ours fill up. Hopefully they teach Hemingway in those other universities. ← Let Me Help You NOT Be Stupid. I agree – get those kids digging some ditches and they’ll start studying instead of watching tv. This really works. My own dear children spent their summers harvesting stuff from our garden and today they are successfully and gainfully employed college graduates. I have noticed that none of them have gardens but I assume it is a time thing. It is amazing that children are so eager to do adult jobs, up to the very moment they are actually capable of doing them. Lorca. I love your post! If only I had a ounce of your humor and wit. I’m still laughing at some of the truths in your post! Kids have no idea what life could be like and you gave a perfect example of a glimpse at one possible future. We need more mom’s like you, lol. I heard that middler women- after extra infusions of Mojitos will hit on us old guys too. Just to make us smile. Lorca honey, that was one of the BEST blog posts I ever read. You are onto something there. Kids need to work so they will appreciate education. It is that simple. You are so right and your sense of humor ticks on like a clock. Thanks for sharing your thoughts and insights! I appreciate it.